Email: I am sure you know that Vlad is still known as a hero in Romania and nearby areas. These areas have a large Eastern Orthodox Christian population. I myself am Orthodox, and have friends that are as well. Many people swear their family can be traced to Vlad’s line and state it with pride and admiration. Stating he was a hero for his defense against the Turks and defense of Orthodoxy. What I am getting at is if Eastern Orthodoxy stands at this point, where does this put them in the conflict in Hellsing? Erin: The Orthodox church doesn’t come up in the canon Hellsing series, and I don’t know much about its organization. My guess is that they wouldn’t get in Hellsing’s way as long as they didn’t realize Alucard was Vlad. Since I’m not an expert, though, I’m going to pass the question to my Romanian and/or Orthodox readers. 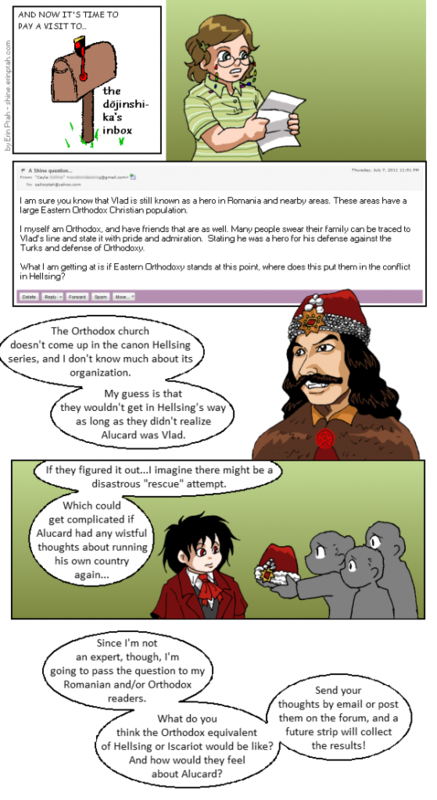 What do you think the Orthodox equivalent of Hellsing or Iscariot would be like? And how would they feel about Alucard? Send your thoughts by email or post them on the forum, and a future strip will collect the results!